When a life ends, friends and loved ones need a way to cope, to grieve, to pay their respects and to begin healing. For centuries, funerals and memorial services have served this purpose. Too often, however, many of today’s mourners find themselves unable to participate, whether due to distance, illness, or family and work commitments. 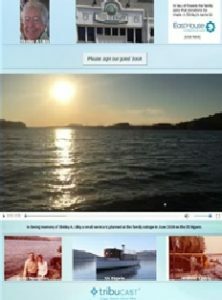 The family looked to TribuCast™ to help them include all the friends who wanted to pay their respects but couldn’t, and to help them gather photos and memories spanning almost 90 years. 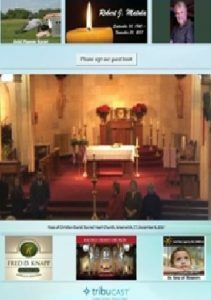 They found that TribuCast™ not only enabled them to include those who could not be there in person, but also helped them to quickly collect more than 200 wonderful photos through their TribuCast™ Shutterfly tribute link. This collection of photos quickly evolved into a memorable slideshow for the post-service reception. The family looked to TribuCast™ to address their timing, health and distance challenges. 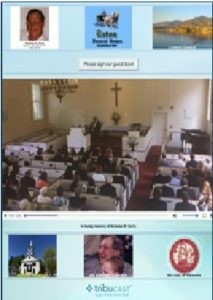 In addition to helping family who couldn’t be there in person, TribuCast™ allowed more than thirty longtime friends from across the country and around the globe to attend the service remotely. The condolences and memories these friends provided brought unexpected, but much appreciated, comfort to the family. 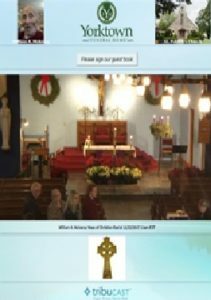 Given their plans for a small, delayed service and their loved one’s large and widely distributed group of friends, the family looked to TribuCast™ for assistance. 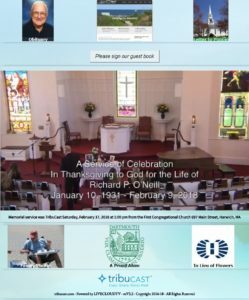 They found that TribuCast™ offered them a virtual gathering point for friends to begin to cope, grieve, honor and heal near-term and an opportunity for family and friends to attend remotely when the service happened in the following spring. The family looked to TribuCast™ to make that connection. What they didn’t realize was that family and friends from three continents would visit their father’s TribuCast™ to grieve for their loss and pay their respects. In all, more than thirty people attended, some from as far away as Australia, some from as close as the nursing home down the road. The family looked to TribuCast™ to help bring their father’s service to those who couldn’t be there otherwise. They didn’t expect the beauty and majesty the holidays lent to their father’s funeral and were thankful to have a record of it.